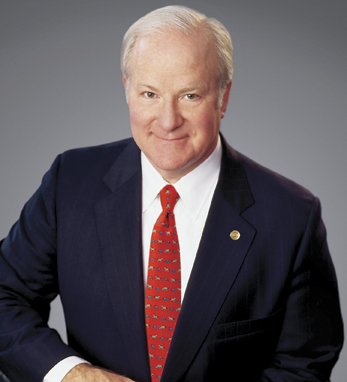 John F. Barrett is chairman, president and CEO of Western & Southern Financial Group, a Cincinnati-based diversified family of financial services companies, which, under his leadership has grown from a $5 billion Midwestern life insurance company to a national financial services enterprise with assets in excess of $55 billion. John is a director and former chairman of the American Council of Life Insurers, president of the Association of Ohio Life Insurance Companies, and a past chairman of the Ohio Business Roundtable. He is a trustee of the Financial Services Roundtable and the Business Roundtable in Washington, DC. He is also on the board of Cintas Corporation and Convergys Corporation. He is a member of the Cincinnati Business committee and co-chairman of the Greater Cincinnati Scholarship Association. A fourth-generation Irish American with roots in counties Kilkenny and Mayo, John holds a bachelor’s in business administration from the University of Cincinnati. He and wife, Eileen, have three grown children.